Latvia 5 euro 2014 "Baltic Way"
Obverse: The obverse is crossed by a braid with ribbons in the colours of national flags of the three Baltic Republics woven in it. The inscription "5 euro" is on the right. 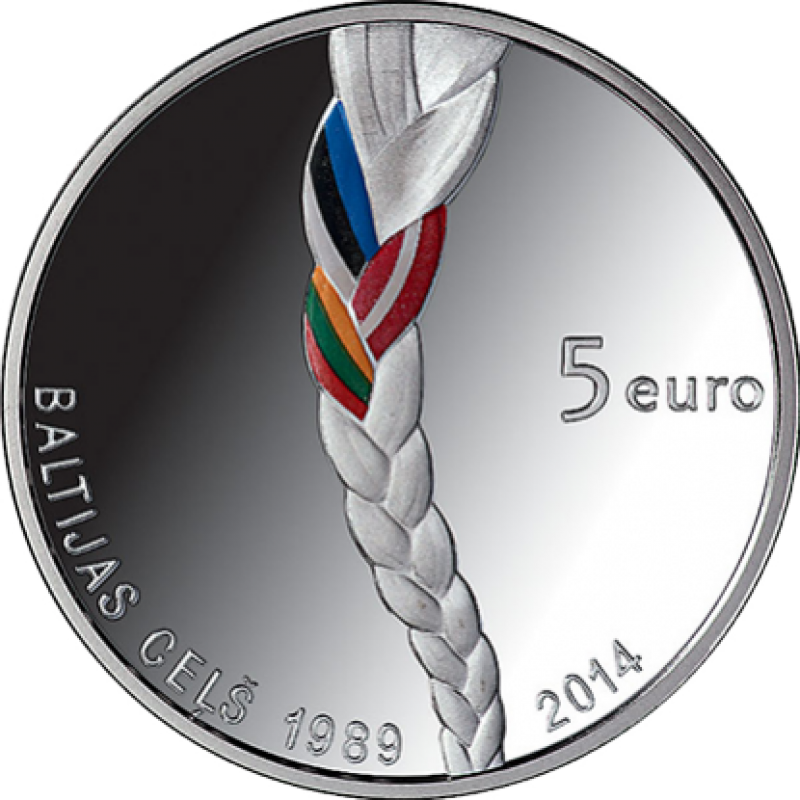 The lower left part of the obverse bears the semi-circled inscription BALTIJAS CEĻŠ 1989, with the year 2014 on the right. Reverse: The reverse displays a vertical image of a tree trunk with exposed roots. There are two semi-circled inscriptions – ATMOSTAS BALTIJA (Awakening Baltics) on the left and LIETUVA LATVIJA EESTI (Lithuania Latvia Estonia) on the right. 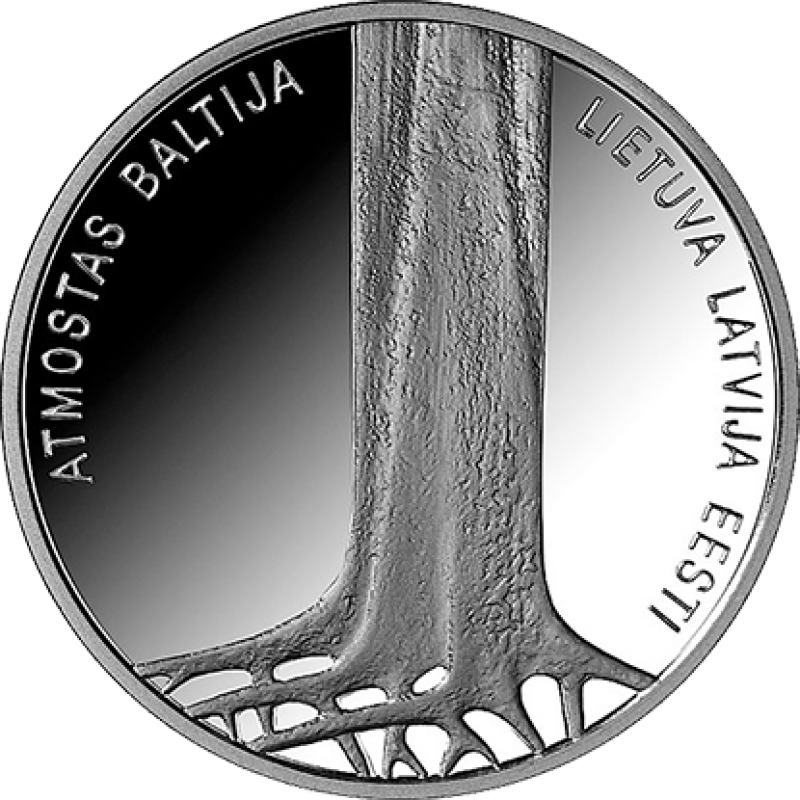 Edge: The edge features two inscriptions LATVIJAS BANKA and LATVIJAS REPUBLIKA, separated by rhombic dots. The idea of freedom is one for which people have always been willing to pay the highest price. In Estonia, Latvia and Lithuania the yearning for freedom found a powerful expression at the end of the 1980s. The Baltic peoples were united by a common goal: to shake off the shackles of the Soviet totalitarian empire, which had meant subjugation of half a century and which had originated in the Molotov–Ribbentrop Pact. This mutual non-aggression pact signed on 23 August 1939 by the USSR and Germany was supplemented by a secret protocol, which in fact meant the division of six independent European states into spheres of influence and occupation. The Molotov–Ribbentrop Pact prepared and initiated World War II. The USSR, an active ally of Nazi Germany, occupied the Baltic States in the summer of 1940 in direct consequence of the pact. The social and economic orders were forcibly changed in accordance with the interests of the USSR and subject to the dictatorship of communist ideology and regime. The Baltic States were incorporated into this superpower, experiencing deportations and killing of their citizens, nationalisation and collectivisation, political terror and life behind the "iron curtain" in isolation from the world. Fifty years after the criminal Molotov–Ribbentrop Pact was signed, on 23 August 1989 at 7 p.m., about two million residents of the Baltic countries joined hands forming a 600-kilometre-long human chain that joined Tallinn, Riga and Vilnius for 15 minutes. This unique action drew the attention of the entire world, highlighting the historical injustice and asserting that the idea of freedom and independence is very much alive in the minds and hearts of the three Baltic nations. In the lexicon of non-violent struggle, the message of Awakening, Popular Front and Singing Revolution was supplemented by another striking entry – the Baltic Way. It was like an informal referendum that demonstrated to the occupation power how united the Baltic nations were in their desire to regain their freedom and renew their independence. The Baltic Way demonstrated the effectiveness of non-violent struggle and the power of unity.